This series presents reviews covering all aspects of haemodynamics and haemorheology. Topics covered include the complexities of microcirculation, the rheology of blood and blood vessels, and the mechanics of blood flow in arteries and veins. The contributions aim to reflect the advances being made in experimental techniques and instrumentation for laboratory and clinical measurements and in numerical and mathematical modelling. Emphasis is placed on the scientific and engineering principles involved, but particular attention is also given to the clinical significance of this area of research. 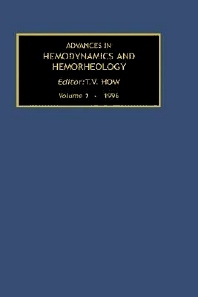 Topics covered by this volume include viscoelastic properties of blood and blood analogues; blood flow through narrow tubes; and numerical modelling of blood flow. Contents. List of Contributors. Preface (T.V. How). Viscoelastic Properties of Blood and Blood Analogs (G.B. Thurston). Microrheological Models of Red Blood Cell Mechanics (D.B. Biesel). Numerical Modeling of Blood Flow (F.S. Henry and M.W. Collins) Flow Visualization and Measurement with the Photochromic Tracer Technique: Hemodynamic Applications (G.G. Couch and M. Ohja). The Application of Magnetic Resonance to Blood Flow Studies (D.N. Firmin and R.H. Mohiaddin). Turbulence in the Cardiovascular System: Its Physical Nature, Pathophysiological Role, Measurement, and Analysis (T. Yamaguchi). Pulmonary Artery Blood Flow and Hemodynamics (B. Ha, W. Henry, C. Lucas, H.W. Sung, and A. Yoganathan). IN VIVO Hemodynamic Measurements (J.M. Hasenkam). Hemodynamics of Vascular Prostheses (T.V. How, R.A. Black, and P.E. Hughes). Index.